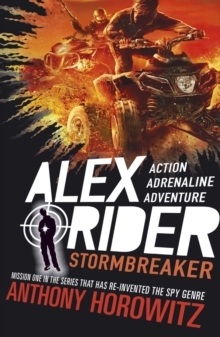 The first book in the number one bestselling Alex Rider series. In the first book in the number one bestselling Alex Rider series by Anthony Horowitz, fourteen-year-old Alex is forcibly recruited into MI6. Armed with secret gadgets, he is sent to investigate Herod Sayle, a man who is offering state-of-the-art Stormbreaker computers to every school in the country. But the teenage spy soon finds himself in mortal danger.